As anyone who follows land use issues on the Monterey Peninsula already knows, Ed Ghandour has been fighting the Coastal Commission for decades over his plans to build something he calls the Monterey Bay Shores Ecoresort on a shrinking strip of sand dunes at the north end of Sand City. With sea level rise and coastal erosion accelerating, it’s not clear there’ll be anything left to build on by the time he actually gets a permit, or how long anything built there will actually last, but that’s all old news. More interesting, from a legal point of view anyway, is Mr. Ghandour’s recent claim that he, and not the state, is the owner of the beach adjacent to his property. This began with the appearance of the signs, shown above, threatening beach strollers with prosecution for trespassing. No one was much impressed, or paid the signs much mind. 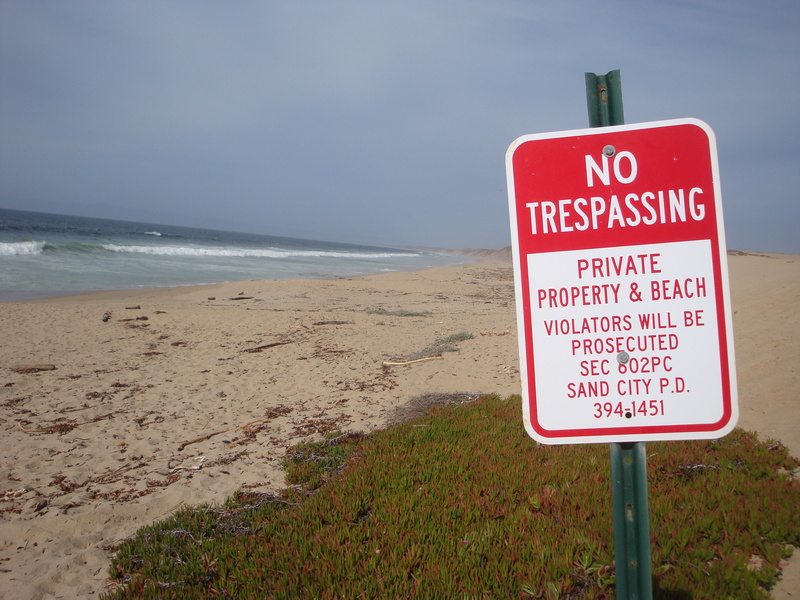 After all, beach-loving Californians tend to be well aware that private property ends at the high tide line. And this isn’t just some socialistic California notion. Legal prohibitions against private ownership of the beach reach back at least as far as the reign of the Roman Emperor Justinian, 1,500 years ago. In fact, the idea that the beach should be a public space is probably as old as the concept of private property. Justinian gets the credit simply because the oldest surviving law books referring to this doctrine date from his time. By the Elizabethan period, English law had evolved to handle the issue by declaring the beach the property of the crown, to be held in trust for the use of the people. In other words, the Queen owns the beach, but she can’t sell it off. She holds it for the people to use in common. And so the law remains in California today. The state holds the beach in trust for the public. That doesn’t mean the state can’t exclude the public from portions of the coastline due to safety or other concerns (nuclear power plants, military reservations, etc. ), but it does mean they can’t grant ownership of the beach to private parties. Predictably, the Coastal Commission, whose mission is to protect public access to the coast, ordered the signs removed, and Ghandour’s people did remove most of them; although not the one pictured above. This led, back in February, to a story about the dispute in the Monterey County Weekly; a story that included a very interesting tidbit of information. But … he owns the beach based on a Mexican land grant? How could a Mexican land grant give him ownership of the beach? The answer may be found in the curious case of Summa Corp. v. California State Lands Commission 466 U.S. 198 (1984). In Summa, a developer owned land around a coastal estuary in the Los Angeles area known as the Ballona Lagoon. They wanted to fill in the lagoon in order to create more land for development. The state said no because the lagoon was below the high-tide line and, thus, held in trust by the state for the benefit of the people. Lawyers for the developer, who deserve serious points for creativity, argued that the land was nevertheless private property because 1) the lagoon fell within the lines that marked the boundaries of the original Mexican land grant in the area; and 2) under the 1848 Treaty of Guadalupe Hidalgo, Mexican land owners, and those to whom those land owners’ lands eventually passed, can’t be deprived of property rights they enjoyed under Mexican law. The state poured cold water on this argument by pointing out that, as Mexican law also prohibited private ownership of tidelands, the owners of the property hadn’t been deprived of any property right that their predecessors had enjoyed under Mexican law. The trial court agreed with the state and the California Supreme Court affirmed that decision. But the developers weren’t done. They appealed to the U.S. Supreme Court and finally got the ruling they wanted. The Supreme Court ruled that even though the tidelands hadn’t been private property under Mexican law, they had become private property when the Land Commission set up by the federal government, in 1851, to adjudicate land grant disputes had confirmed a map showing the lagoon inside the property lines. The Court, after engaging in a complicated set of legal gymnastics that needn’t concern us here (primarily attempts to explain how the state could give something away by neglect that it couldn’t give away on purpose), said essentially that if the state had wanted to preserve its public trust lands in the Ballona Lagoon it should have raised the issue with the federal Land Commission before the map was confirmed. This decision provoked a brief panic among coastal advocates who thought, at first, that the ancient principle of public beach ownership had just been eliminated for most of the California coast; much of which is adjacent to Spanish and Mexican land grants. But then it was realized that the maps of these coastal land grants do not include a defined property line along their ocean side. In other words, the ocean (i.e. the high tide line) is the seaward property line – a line which, under well-established principles of property law, moves inland as sea level rises and the beach erodes or outward, should sea level fall or additional sand be deposited. In any case, not a situation in which private ownership of the beach, under the ruling in Summa, could occur. So where does this leave Mr. Ghandour? Mr. Ghandour’s dunes, together with the City of Seaside and a lot of the former Ft. Ord, fall within the Rancho Noche Buena land grant. While this grant may or may not have touched the coast at a point on or near Mr. Ghandour’s property when the grant was made in 1835, or when it was confirmed by the federal Land Commission, in 1862, it was clearly not a grant that used the coast as a boundary. Instead, a boundary line was drawn roughly paralleling the coast, but generally behind the coastal dunes. Interestingly, the map approved by the federal Land Commission, which would definitively settle the issue of what the boundaries of the federally approved Rancho Noche Buena were, appears to be missing from the Land Commission archives, stored at the Bancroft Library. The 1877 St. John Cox map of Monterey County depicts a boundary that never touches the beach, as does the Lou G. Hare map of 1898. 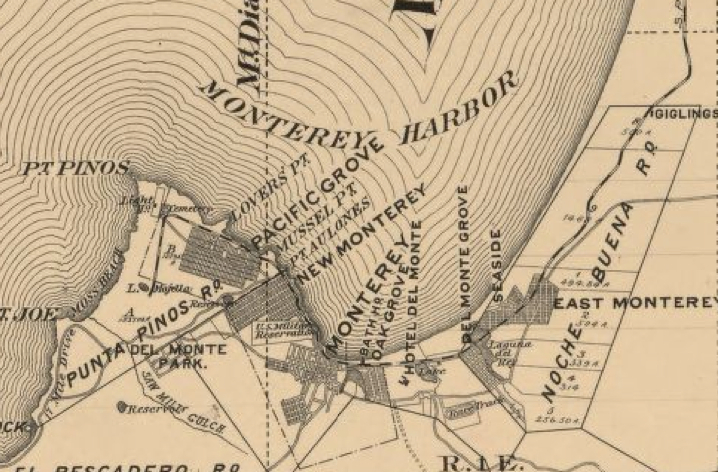 Yet the USGS Monterey Quadrangle, published in 1913, depicts the boundary as touching the bay in the approximate location of what is now Mr. Ghandour’s property. The boundaries of Rancho Noche Buena as they appear on the 1898 Hare map. Maybe the difference is due to sloppy surveying and map-making and maybe it’s due to the fact that coastal erosion has been bringing the sea ever closer to Rancho Noche Buena’s boundaries, wherever they are. In any case, even if the beach in front of Mr. Ghandour’s property isn’t yet within the historic boundary lines of Rancho Noche Buena, there’s little doubt that it will be someday soon – as will the beach in front of other private Sand City parcels currently slated for development. It would be ironic indeed if a land grant intended to exclude the land closest to the ocean, ended up turning a piece of the coast into private property, but it is clear that, under the ruling in Summa, that possibility exists – and with projected rates of sea level rise likely to bring the beach into other formerly landlocked Spanish and Mexican land grants, this may be an issue that affects more than just the Monterey Beach. On the other hand, as Coastal Commission staff has pointed out, public use of the beach has surely created a public easement regardless of ownership. But getting that easement recognized by a court is likely to require the testimony of people who used that section of beach prior to 1972. Those who want to preserve public access between the newly created Ft. Ord Dunes State Park and the rest of the Monterey Beach, might want to start searching for such people and preserving their testimony. Yet even the establishment of an easement won’t necessarily be the end of the dispute. A decade of severe hurricanes has courts in Florida and Texas grappling with the question of whether public easements on beaches migrate or “roll” inland along with the beach (most seem to think they do as long as the migration is gradual), or are lost to the waves (some think they are if a large chunk of coast disappears in a single storm). Where California will fall on the question remains to be seen. All it seems safe to say at this point is that sea level rise is likely to put the ancient doctrine of public beach ownership under serious pressure in any number of unanticipated ways. The dispute over Ed Ghandour’s signs may well be simply the first skirmish in what will someday become an all out struggle to preserve California’s coastal access traditions. Bonus Question: Once coastal erosion has left Mr. Ghandour’s property entirely in the bay, will his Rancho Noche Buena land grant rights allow him to exclude others from boating and fishing on his property? Special thanks to the Monterey Public Library staff for their assistance in researching early maps. This entry was posted on Tuesday, April 30th, 2013 at 10:41 pm and is filed under Coastal Development/Erosion, Courts, History, Politics. You can follow any responses to this entry through the RSS 2.0 feed. You can leave a response, or trackback from your own site. One Response to Who Owns the Beach? I wonder if the humpbacks who feed there will be allowed on his property.